Dani Pedrosa rides a superb race to take victory at the Motul Grand Prix of Japan while Rossi extends lead over Lorenzo to 18 points. 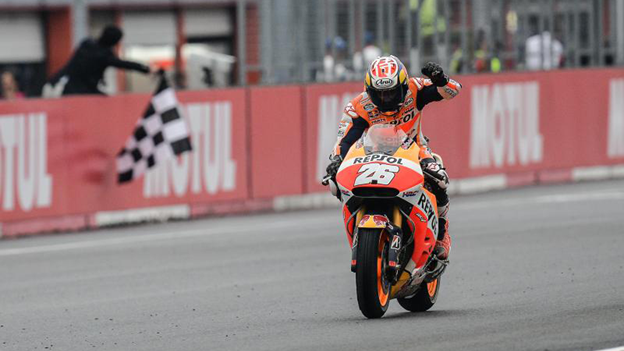 The Repsol Honda rider came from sixth on the grid to take his 27th MotoGP™ win and first since Brno in 2014 on a drying track at the Twin Ring Motegi. Movistar Yamaha’s Valentino Rossi (+8.573s) crossed the line in second to record his 14th podium of the season as he extended his lead over his teammate Jorge Lorenzo to 18 points in the World Championship standings. Lorenzo (+12.127s) completed the podium after struggling with front-tyre wear late on in the race to record his 94th premier class rostrum. There were only really three riders in with a chance to win the race in tricky conditions at Motegi that saw 50,000 fans packed into the grandstands despite the rain. The race started on time despite a two-hour delay to the morning’s Warm Up Session, but the track remained damp meaning all riders went for wets. At the start of the race the outcome looked very different, as Rossi got the holeshot into turn 1 only for Lorenzo to take him through turns 3 & 4 for the lead. At this point things looked ominous for Rossi as Lorenzo broke away at the front in his usual fashion and opened up a 2 second lead by the end of lap 3. Rossi appeared to have no answer to his teammates pace and had to fight off the advances of the Ducati Team GP15 of Andrea Dovizioso during the early stages of the race. In a sign of things to come though, Dovizioso started to experience front tyre issues as a dry line appeared on track and began to drop back rapidly by lap ten. At this point Pedrosa had made his way up into fourth and was by far the fastest man on the track. On lap 11 the Spaniard passed Dovizioso as the Italian ran wide and started to chase down Rossi in second, who had a 2.7s advantage. Lapping 1.5s faster that the two Yamaha’s in front of him, Pedrosa caught Rossi with 9 laps to go and suddenly Lorenzo was struggling as his front tyre started to rip itself to pieces. Rossi went with Pedrosa and they both began to hunt down Lorenzo, who had a 2.7s advantage with the two-time MotoGP™ world champion appearing to be going backwards at this point. Pedrosa blasted past him on the straight as they completed lap 17 to take the lead, and never looked back as he went on to take a commanding victory and continue his record of winning at least one race in every season he has competed in MotoGP™. It then became a game of risk versus reward between the two Yamaha teammates as Rossi closed in on his title rival, but both were tiptoeing around on their shredded front tyres. Rossi appeared to have looked after his slightly better though and Lorenzo ran wide at turn 3 with 5 laps to go to gift the ‘Doctor’ second. Pedrosa rode superbly in the final laps to take the race win by over 8.5s from Rossi, with Lorenzo completing the podium a further 3 seconds back. Although it was clearly Pedrosa’s day after a sensational ride in the wet, Rossi was delighted with extending his lead in the standings as he hopes to secure his tenth World Championship title in 2015. Pedrosa’s teammate Marc Marquez (+27.841s) crossed the line in a lonely 4th nursing the broken bone in his left hand ahead of the Dovizioso, who despite his tyre issues, held on for fifth. LCR Honda’s Cal Crutchlow came out on top by just 0.404s in an excellent battle for sixth against his compatriot Bradley Smith on the Monster Yamaha Tech 3 to finish as the leading Satellite rider. Crutchlow passed Smith on the last lap to secure sixth, his best result since he also finished sixth at Assen. Smith crossed the line in seventh to make it 21 point scoring finishes in a row, but dropped down to sixth in the standings, 2 points behind Dovizioso. Wildcard Katsuyuki Nakasuga (Yamaha Factory Team) rode brilliantly to finish in eighth ahead of Hector Barbera on the Avintia Racing Ducati. Barbera took the Open class win and also recorded his first top ten finish of the season to re-take the lead in the Open standings by two points from Loris Baz (Forward Racing), who was forced to retire from the race. Scott Redding (EG 0,0 Marc VDS) completed the top ten ahead of Aleix Espargaro (Team Suzuki Ecstar) in 11th, with the second wildcard Takumi Takahashi (Team HRC with Nissin) 12th. Nicky Hayden was the leading Open Class Honda in 13th, with his Irish teammate Eugene Laverty crossing the line in 17th. Jack Miller (LCR Honda) crashed twice during the race, after at one point leading the Open class battle, and was forced to retire. There were also DNF’s for Danilo Petrucci (Octo Pramac Racing), Pol Espargaro (Monster Yamaha Tech 3), Maverick Viñales (Team Suzuki Ecstar) and Andrea Iannone (Ducati Team). Rossi (283pts) now has an 18-point lead over Lorenzo (265pts) with just three races remaining, while Marc Marquez remains in third with 197 points.